I brought this on a whim a few years ago. I’d not seen much about it but what I did see painted this out to be a pretty powerful book about amazing women throughout history. It delivered on the amazing women but lacked quite a bit on the power. It reads like it was written for a very young audience with simple cut back versions of each person’s story. With only one page per woman/girl I was left wanting more in a lot of cases and I found myself reaching for google to find out more. 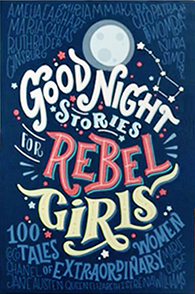 I thought that this wasn’t particularly a bad thing, it was educating me on many brave and intelligent women who I’d otherwise have known nothing about, then I thought that if this is intended for younger audiences as bedtime stories, as the title suggests, it might not be enough to peak their interests. Also not many kids have the opportunity to google a quick. On the one hand this set out to do what it intended it made me aware and appreciative of so many strong, beautiful, intelligent and courageous women out there. On the other hand it wasn’t very compelling. I had this next to my bed since last August and I only finished it 23rd May so I really wasn’t reaching for it. At first I put this down to the book slump but as I reflect on reading it now I just don’t feel like I enjoyed reading it. I would say that if you have a young girl and you’re looking for something inspirational for them to read with really women they can aspire to this is a good pick. Each person takes only one page so it can take 5 minutes or half an hour. If they take to a certain person mentioned in the book you will need to get on google for them to get a little more information than where they were born and a paragraph on how they became inspirational. Which female from history is an inspiration to you? They’d be great fpor your neices!